This provider is not accepting online appointments currently. Call the doctor's office at (240) 362-7294 to book an appointment. Cathy Chapman has been a nurse since 1979 and a nurse practitioner since 1995. Her nursing experience included ICU, home health, hospice, and sexual asault forensic examiner. As a nurse practitioner, she is certified as a family primary care NP as well as a family psych-mental health NP. Cathy is involved in various community and professional organizations . She is district director for Nurse Practitioner Association of Maryland. She is a founding member of the Nurse Practitioner Caucus of Western Maryland. Cathy has been involved with medical mission work since 1997. She has lead 16 medical brigades to Honduras in Central America to work with malnourished children and provide health care in rural mountain communities. 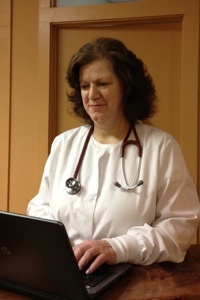 Cathy has received numerous awards as a nurse practitioner including Western Maryland Area Health Education Center AHEC Caucus Nurse Practitioner of the Year in 1999 and 2015, Western Maryland AHEC Distinguished Service Award 2001, American Association of Nurse Practitioners Maryland State Award for Excellence in 2008 and 2014, Baltimore Magazine Excellence in Nursing for Family Practice in 2015, and the Maryland Outstanding Rural Health Practitioner in 2015.